One of the most important things to learn when working with hydraulic equipment is how to safely replace worn out hydraulic hoses. Staying on top of maintenance is the first best step, but when it comes time for hydraulic hose replacement, there are other tips that can help you to improve safety across the board. Safety tips for hydraulic hoses are always something that should be shared with employees and co-workers, as accidents caused by hydraulic hose failure can be very serious. Make sure to keep a record of inspections made on all hydraulic equipment. While there is no specific lifespan for hydraulic hoses due to variations in use, liquid, and pressure, the more you can do to keep track of inspections, failures, and replacements, the easier it will be to predict the end-of-life for hydraulic hoses in the future. Greater Fall River hydraulic safety cannot be stressed enough. If you have certain hoses on specific pieces of equipment that are wearing out faster than others, you have the opportunity to make changes. This can be in the way that you replace worn out hydraulic hoses, such as increasing the frequency or the warnings signs that you look for, or in the type of hose that you use. Metro Industrial & Marine Supply provides custom hydraulic hose replacement services for our customers throughout the Southcoast region. One of the best safety tips for hydraulic hoses is to make sure that you have the right size and type for the best possible fit. With a better fit, you reduce the chances of failure and accidents in the workplace, improving safety for everyone involved. This also works to extend the life of the equipment by maintaining it effectively on a regular basis. If you notice worn out hydraulic hoses in certain areas where hoses rub up against each other or rub up against equipment, consider using hose restraints. These can be used to prevent the hydraulic hose assembly from reaching the point of failure before its time. It also reduces the risk associated with the hose coming loose during operation. Sometimes abrasions are not the culprit, as the pressure from the liquid inside the hose can cause it to whip around and break free, resulting in a dangerous failure. The seriousness of this type of Greater Fall River hydraulic safety cannot be overstated, as it can result in extreme injury to workers and considerable damage to the equipment. Restraints can be used to prevent hoses from whipping around in the event that they break free. Your inspection log should reveal which hoses are wearing out before others so you can find new methods for increasing safety in the workplace. This creates a much safer environment for everyone involved. Hose restraints should not be used in place of properly crimped hoses to the fitting. 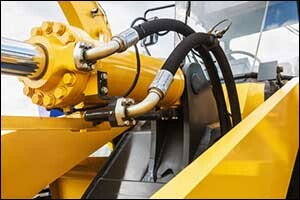 Metro Industrial & Marine Supply can assist customers in getting the right connections for hydraulic hose assemblies through our custom hose services. There are some instances where the use of a “line of sight” hose sleeve might be able to increase Greater Fall River hydraulic safety. These sleeves can protect employees and visitors to the job site from any pinhole leaks or other types of hose failures. The sleeve is stretchy and tightly woven, designed to absorb the pressure of a burst or hose leak. It is made from nylon and is designed to contain any leaking fluids long enough to shut down the machinery safely and prevent injury. Once again, these hose sleeves should not be used instead of hydraulic hose replacement, as they are only meant to be a temporary solution. Consider using hose sleeves in exposed areas where there is a lot of worker traffic. These can also be a great idea as safety tips for hydraulic hoses on equipment that frequently experiences worn out hydraulic hoses faster than other machinery. Remember, the sleeve will still leak fluid from the ends, so this is just to protect employees and equipment from damage that could come from a hose failure. If you are in need of hydraulic hose replacement for worn out hydraulic hoses, stop by our location in New Bedford. We provide quality services designed to improve Greater Fall River hydraulic safety for many different customers across multiple local industries. You can also give us a call at 508-996-8400 to speak with one of our technicians about your specific needs. Located in New Bedford, we provide services to customers throughout the Southcoast region, including Southeastern Massachusetts, Boston, Cape Cod, and Rhode Island, as well as mail-order customers all across the country and around the globe.